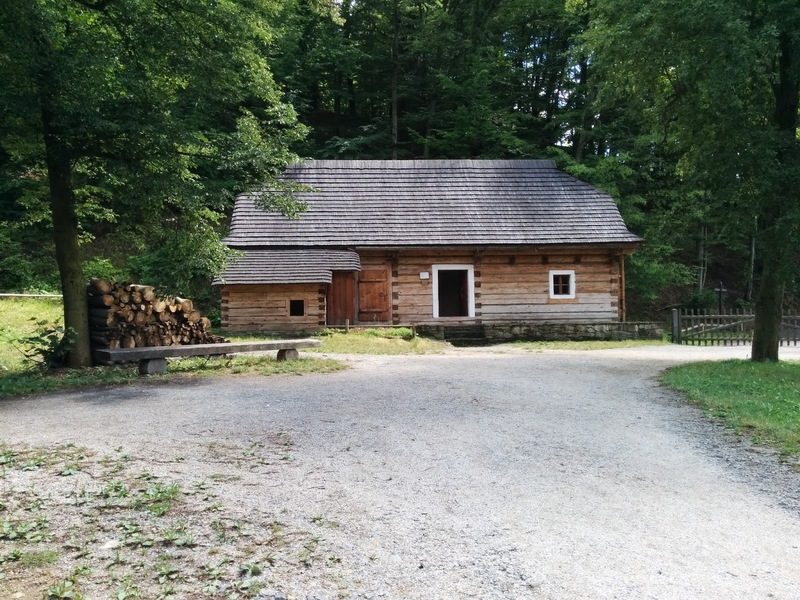 If you are interested in Czech history, you should visit the Valašské muzeum v přírodě in Rožnov pod Radhoštěm, in English: the Wallachian Open Air Museum. I feel like I should add some sort of superlative here, but there really are no words that can do justice for what the experience of going there was like for me. Basically, it gave me the experience to feel and understand my ancestors and their way of life in a way that nothing else can even come close to approaching. I have been to many historical villages: the Shaker village, Old Nauvoo, the Living History Farms. None of them were quite like this. What I would like to write about in this post is not a general overview of the museum, but rather the specific experience of visiting Trojanovice 14. This is literally a house from my ancestral village in the Wallachian mountains, transported to this museum and preserved for future generations to see what life was like in the mid 1850’s-1870’s. Lid’ák, Petr, Mill Valley, (Rožnov pod Radhoštěm: Printo), 48-51. The house is a reconstruction of the original building that was situated on a slope under the forest, on the border of the sparse settlement in the mountain village called Trojanovice – Bystrá until the 1980’s. The look and design correspond to the traditional houses from Ostravice and Čeladná where iron mill employees used to live. The interior and surroundings of the house illustrate the situation in the second half of the 19th century. The house is an example of a not very large household that was run by a socially disadvantage family, whose livelihood was based on farming and cattle breeding, along with work in the forest, charcoal burning in charcoal piles, and weaving at home in winter. So, basically, this house was very similar to the houses of the majority of my Trojanovice ancestors. The house consists in a large rustic room, a hall, a chamber and farming rooms located under one roof. Later, at the south side, in front of the barn gate, a timbered pigsty and lavatory were added while at the north side a stone cellar with a hayloft was built – which was not installed here in Mill Valley as it became a part of the house much later, at the beginning of the 20th century. The original ground plan and construction were preserved. Certain changes in the construction are connected with the continuing development of the house in the course of the 19th and the beginning of the 20th century. The house is simply built with wide, mostly halved beams. The entire structure is covered with a saddle roof made of collar beams, provided with sprockets and semi-spherical hip on both gables. The roof is covered with chopped shingle. At first sight, you will notice white reveals in the window and doors. This is a good example of one of the methods applied for the insulation of cut and chiselled areas in order to protect them against dampness, typical for the region of Ostravice. In addition, this is perhaps a decorative element as it was occasionally white-ashed by their owners. Another interesting feature is the ceiling boards that protruded above the window beams. This indicates replacement of the ceiling, probably in the second half of the 19th century. The house was installed on a slope under the forest, in the same way as it was in the original location. Th stone doorstep was built in order to level the slope around the house from two sides. The house was probably built in the second half of the 18th century. The first owner was František Milocha, mentioned in the oldest records of farm houses in the area. His descendants lived in the house until the beginning of the 19th century. From 1813 the house was owned by Jiří Dobiasch. In 1830 the homestead went to Franz Zeman, who lived there with his family until the mid 1850s. The official records of that time confirm the appearance of the house as we know it from the 20th century, however, without the cellar, hayloft and pigsty. 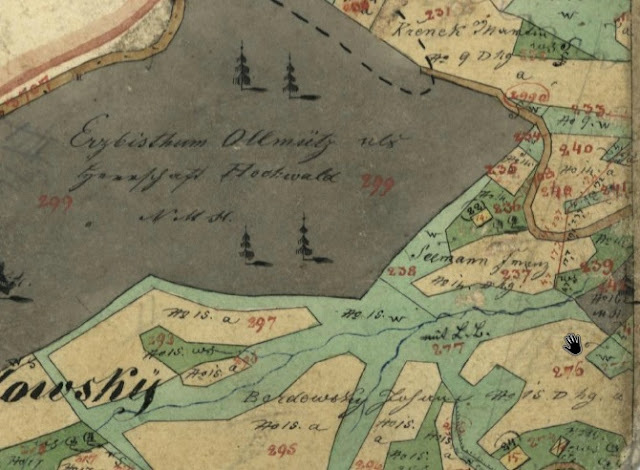 Here is Zeman (“Seemann”) on the 1833 cadastral map, which you can access for all of the Czech lands for free at archivnimapy.cuzk.cz. In 1861 the owner changed for the last time. The homestead was sold for 244 florins to Josef Šmahlík, son of a proprietor of a clearing from Frenštátu pod Radhoštěm. His direct descendants still own the house. Josef Šmahlík and his wife Rozálie raised 6 children. The not very fertile land, sized 1 hectare, could not provide enough food for the whole family. In addition, the animals who lived in the neighbouring forest posed a danger to the crops. Josef Šmahlík was a pasekář. The father worked in the forest, cut trees and moved the logs to charcoal piles where charcoal was produced for the iron mills nearby. In winter, he had another job, as a weaver. He produced cotton cloth – coarse cotton, damask or muslin. Along with woodcutting, home weaving was a frequent job for many people in the region of Frenšát pod Radhoštěm. Most home weavers worked for the textile factories in Frenštát, form which they purchased cotton yarn. They supplied the woven cloth to the agents. Their earnings varied: The annual income per weaving family was, on average, approximately 100 to 150 florins. A producer of damask and coarse cotton made up to 5 florins per week. Home weaving was the job of the Josef Šmahlík daughters, named Johana, Barbora, and Rozálie, who later worked in the textile factories in Frenštát. His younger sons, Josef and Antonín, were fully educated. Not only were they able to read as their sisters could: in addition, they were able to write too. Josef trained as a tailor and found a job in Frenštát pod Radhoštěm. At home, he occasionally repaired garments for other members of the family or made clothes on order. At that time, there was a son named Josef, who was a deaf-mute, and another Josef, the illegitimate son of Johana. They both helped in the fields or aroudn the house. The family owned a cow, as well. Later, they had a pig and several hens. They grew potatoes, oats and rye for bread flour, as well as buckwheat. It was very important to have enough fodder for the cow for the winter. They stored hay in the loft above the large room, which also served as heat insulation. Straw was stored in the barn, on the upper floor, or in the area above the pigsty. At the end of the 19th century the assets were inherited by Rozálie, one of the daughters, who married Jan Cochlar, a weaver. The present installation demonstrates the life and work of Josef Šmahlík in the middle of the 19th century. The furnishings were rather modest at that time. The entrance area comprises a through hall with an open stone oven where the housewife cooked meals and baked bread. The meal was cooked in high stoneware pots or pots in trivets. From the hall, you enter a small chamber used as a storage area for food and dishes. There is a hand mill used for milling coarse flour and semolina. The other door from the hall will take you to the pigsty. The opposite door provides access to the large room. The large room was the only residential room in the house. The whole family lived here. 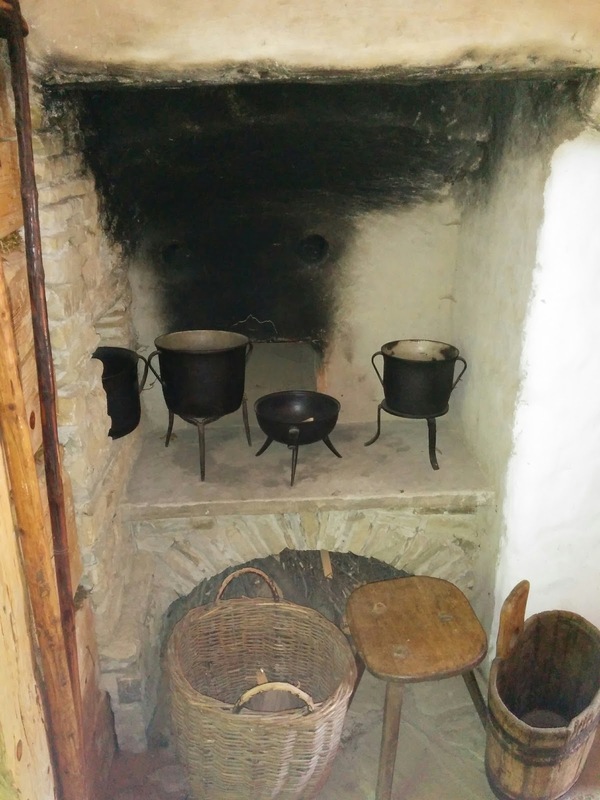 There is a rather small space occupied by a bread oven ,which was used as a heater in winter until the 1930s, when a stove and tiled oven were installed. Opposite the oven you will see the loom used by both Josef Šmahlík and his wife. The rest of the equipment in the room remained unchanged for many years. There were a simple table, a bench that was also used for sleeping, a bed and a wardrobe with carved decorations on the front. The wardrobe is the only newer piece of furniture in the house. It was probably bought due to the influence of the town environment to which Josef Šmahlík’s children were exposed through their work in Frenštát. The tailor’s craft, the livelihood of one of the sons, is demonstrated by means of a wooden board with typical tailor’s equipment, which is placed on the bed fronts. It was used as a workplace, as the tailor used it for unfinished items of clothing on which he was working. Next to the oven you will notice a bench and a shelf with dishes. The area above the table is traditionally occupied by a holy corner with pictures on glass and colour prints. There is also a Holy Cross between the windows that symbolizes the Christian orientation of the family. As regards light, torches were used. The master of the house made them himself. The spare torches were stored and dried behind the oven, where the younger children would sleep. The top beam was used as a clothes hanger. Cotton yarn was dried there, too. The loft was used as a storage area. The area above the large room was the area where hay was placed. In addition, there were moulds with crops, flour boxes and miscellaneous spare items. The agricultural background comprised a pigsty where the cow was also kept. A young calf was often taken into the room. There was a designated place near the oven. In the rear part, behind the sty and chamber, a small barn was added. Farming equipment and the woodcutter’s tools were stored there (saws, axes, wedges and clubs). There is an interesting item here, the stool used when straw was processed for fodder. The log hut on the opposite side was used for the pig. The corridor between the pigsty, the lavatory and the cottage was used as a storage area for tools. They were suspended on the walls. The entire museum was amazing, but this house – well, it was just…it was literally exactly what my ancestors would have lived like, in the same kind of house, from the same exact village. It really gave me some perspective and appreciation for their technology and culture. I would highly recommend a trip to this museum. I always love it when you do. So, personally, I do not think that "a person who lived at a glade" is the clearest definition of the word "pasekář." First of all, the word "glade" does not really mean the same thing as a paseka; a better translation would be "clearing." But the people who lived on these clearings, especially in Trojanovice in the 18th century which was a very new village that only started in the 1720's, – well, they were not just "people", they were "farmers." So, a farmer on a clearing. But in Trojanovice, these pasekas were also on the mountainside and often contained lots (and lots) of rocks and trees. A glade almost implies a natural clearing in the middle of a forest: an image of peaceful, cool tranquility in untamed nature. But having walked around Trojanovice, this does not match the same connotation. The pasekas in Trojanovice are definitely part of a place cultivated by man. They feel more like meadows. They are sloped and sometimes very narrow. None of these facts fit the idea of "a glade." Honestly, I think paseka/pasekář is just an untranslatable term, which is why I called him a "pasekář" instead of writing all that. Does that make sense? What do you think? This was such a great look into how our ancestors lived. I want to go back and spend more time there. Your information and pictures are great.